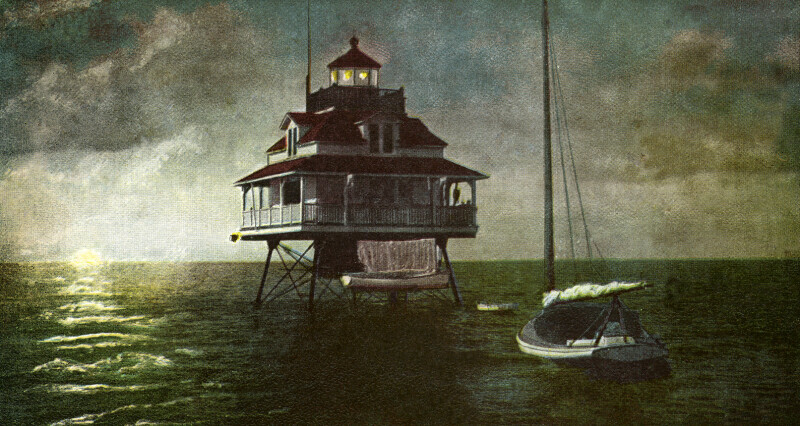 This postcard shows a wooden frame lighthouse that has been built over open water, on top of an iron frame. The house is two stories high, with a circular cupola on the roof. The light is lit, and the sun is on the horizon. There is a deck with dark railings around the cupola, and white railed porch wraps around the bottom floor. There is a sailboat anchored near the lighthouse, and two smaller boats tied to the iron frame. WARNING: You are about to download a 5.0 MB TIFF!